I love the detailing on the hem of your skirt! such an amazing blog! Absolutely love it! Love the details on the skirt, & the color. It is really beautiful look!!! Very lovely outfit,love the skirt. Nice look ! Your skirt is so sweet ! Love the shoulders in the top! O wow, you look just like a model! Beautiful look! 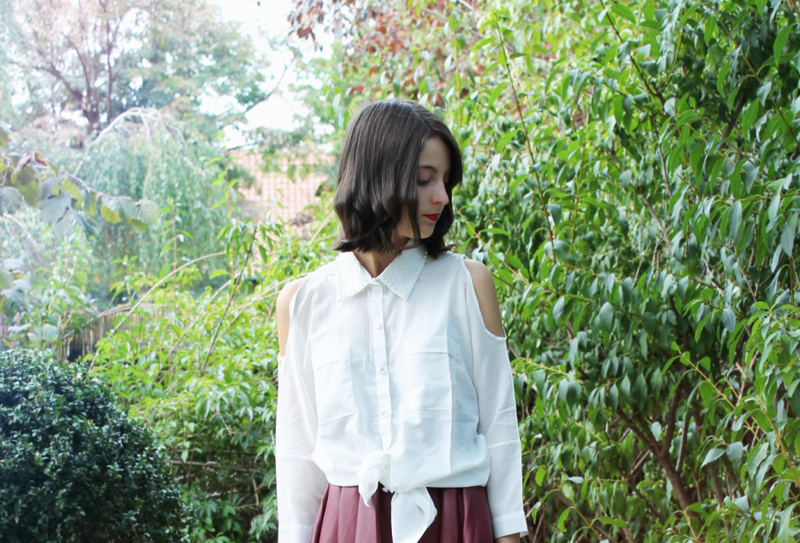 oh wow your blog is so lovely:) the color of that skirt is amazing! thanks for your comment! Love the cutouts on your shirt and how you tied it at the bottom. Beautiful skirt too with awesome detailing! coool look, love your skirt so much.. This skirt suits you perfectly. I love the atmosphere of your captures, it's so dreamy. Great outfit Nora, love the skirt's details. Simple but classic. that skirt is so gorgeous, and the shape looks so nice paired with that shirt! lovely. Hi, Sweetie! You have such a great style for a 15 year old girl! Amazing! Hands down BEST outfit! i am following you on Bloglovin, thank you for your sweet comments! that skirt is absolutely to die for! That's a very pretty skirt!!! Love the scalloping at the hem!! That skirt is gorgeous. love the detail!